It may be cliche, but sometimes less really is more. For those occasions, a little sparkle in your hair is all you need. 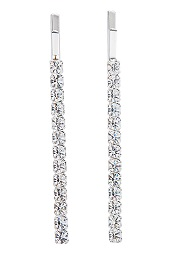 A single row of gorgeous rhinestones accent each silver-toned bobbie pin. Set includes 2 bobby pins. Total-Length 2"
FWO Extras: The approximate length of the rhinestone strip on each bobbie pin is 1 3/4 inches long.